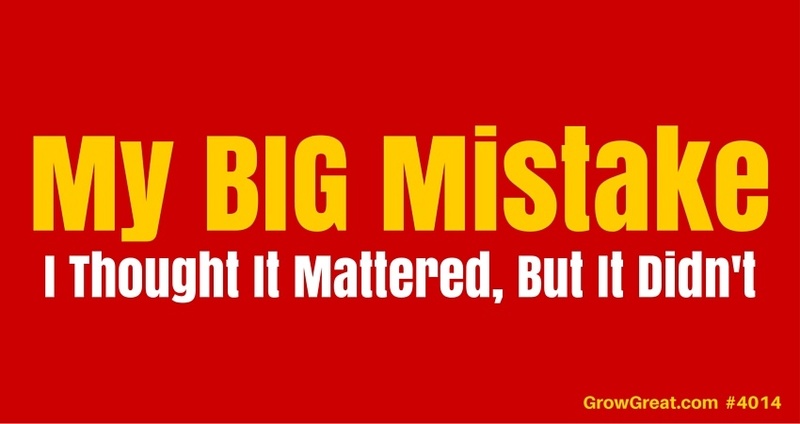 I don’t have enough time, bandwidth or storage to tell you about all the mistakes I’ve made so I’ll just focus today on a BIG mistake I’ve made. I’m sharing this one because I think it’s probably one you’ve made, too. Maybe you’re still making it. Today’s show has just one objective – to help you learn and think by showing you that you’re not alone, even though many days you feel alone. First, let me give you some back story. I started selling hi-fi gear when I was just a kid in high school. I loved music and the gear that would play my records. Yep, I’m old. You may not remember vinyl records. Or the family sitting down to supper every evening. Or the TV show Bonanza or The Andy Griffith Show. Or when ZZ Top’s first record came out. Well, I’m old enough to remember all of that. Little did I know my first job would morph into launching me into a lifelong career in the consumer electronics business. Such is life. Like many of you, I stumbled into a career where I was blessed to be given the helm of a multi-million dollar operation by the time I was in my mid-20’s. I’ve spent most of my adult life leading and building organizations. My education mostly happened in the real world of operating a business, even though I did attend journalism school at LSU. I’m an operator. Proudly. Part of being an operator was founded in selling because my very first job was in sales. I cared about people. I enjoyed talking with people. Early on, I was mostly interested in finding out what their favorite music was and how I could hook them up with a killer stereo to play their favorite records. That’s how it started and honestly, not much has changed. I still enjoy finding out what people get stoked about — and what problems they’ve got that I may be able to help with. For the past 7 years I’ve been mostly coaching and consulting with business owners or top executives. I’ve reinvented myself more times than I can count, but that partly goes with the turf of growing older. The hippies of the 60’s were just slightly before my time, but I remember being a grade school kid during that time. “Finding yourself” was a mantra of that era. I’d like to tell you that I found myself very early on, and in a sense I suppose I did. But mostly, it’s been a lifelong journey of finding myself only to discover I’m not who or what I thought I was, or that I want to head in a different direction. During my formative years of running businesses we didn’t use (and had never heard) the word PIVOT. We grew up learning to fix our problems by learning from our mistakes. When somebody gave it a cool name, PIVOTING, I was rather jealous that we didn’t have that term during the early years of my career. I have to tell you though — the term might let some people off the hook in facing their failure. For example, people often use failure as a badge of honor. It’s as though they’ve mistaken failure being the point of trying. I’m not in favor of putting so much pressure on success that we refuse to try, but nor am I a fan of not putting enough pressure on it to make our effort count. That brings me to something that we all face and something that in recent months has too often put me in a funk. You’ve heard the adage that fear stands for False Evidence Appearing Real. That resonates with all of us. Our fear is real. Google “fear” and you’ll find over 523 million results in less than half a second. Half a billion search results for one of the most fatal four letter words in the English language. Let me use a word that’s better, at least in describing what I often feel. That’s right, I said OFTEN. Fear is defined like this. Here’s the definition of anxiety. In case you were wondering, Google the term “anxiety” and you only get 167 million search results. Not nearly as many as fear. Do those definitions help you understand the difference between fear and anxiety. Probably not very well. Thanks to the folks over at GoZen.com, an organization dedicated to the relief of childhood anxiety, and a video they produced…we can get a better grip on the difference between the two. It’ll only take 90 seconds for you to learn it. Fear is from immediate danger. Anxiety is from our thoughts. BIG difference, right? That’s also my BIG mistake — letting my anxiety completely, and utterly trip me up. I want you to learn from my BIG mistake, even if you’re one of those special (VERY special) fearless people. Boy, do I envy you. As a lifelong operator I’m used to problem solving. Years in the luxury retailing business – one of the fastest moving industries on the planet where profits are razor thin and competition is around every corner – there’s little time to strategize and formulate a plan that takes weeks or months to execute. There’s just no time. You have to have a gunfighter’s mentality and a gunfighter’s skill. Pull your weapon faster than the other guy, fire it faster than him and hit the target. If you miss, forget a pivot. Sometimes your miss can be deadly and set you back months, if not years. That margin for error adds to the pressure of making sure your fast action is as on point as it can be. And I loved it. Even my wife called me a stress junkie – for that kind of stress. The stress of competing and being fast drove me for over 4 decades. There was only one word for it, exhilarating. It was like oxygen for me. Back in 2009 I stepped away from the C-suite to serve other CEOs and top executives. At first, with consulting. Roll up your sleeves, get your hands dirty, do the work kind of stuff. I enjoyed the work, but was more often than not frustrated by a business owner or CEO who wanted one or more of the trifectas of business building: get new customers, serve existing customers better and no go crazy in the process. But I had a problem. I was – and always have been – fanatical about customer experience. Making customers happy wasn’t negotiable for me. Ever. I wanted customers to be dazzled. Sometimes I found myself doing work for a CEO or business owner who wasn’t so passionate about it. Few things in my career frustrated me like getting in my car and driving home from a client engagement knowing they had very unhappy customers and they just didn’t much care. So I walked away from it. Consulting was something I was good at, but I found it too difficult walk away with no ability to affect the outcome. The execution part was missing. That was almost 3 years ago. Say hello to what most call coaching — I just started by calling it serving because that’s what it is. Now I was onto something. I wasn’t bringing the answers. Mostly I was bringing the questions, something I was always good at. Since I was in my 20’s organizations I’ve led have heard me preach, “The quality of our questions determines the quality of our business.” I preached it because it was true. It still is. The better our questions, the better opportunities we have to build a great business. And deliver great experiences to our customers. So it seemed fitting to take that experience in running businesses and in asking great questions to serve other CEOs, business owners and top executives. I’d connect with one leader who would need and want my help. That would lead to another. I wasn’t a marketing genius by a long shot, but I was focused on the work – the service to help people grow and to help them grow their business. Unlike some people in this field, I wasn’t driven to become a fixture. Repeatedly I told clients that their success was my success. I had a vested interest in helping them achieve more. Sometimes that meant fixing a problem. Sometimes it meant seizing an opportunity. Sometimes it was purely work related. Sometimes it wasn’t – it was very personal. It didn’t matter. I was a resource with a single aim of helping this leader navigate through whatever water they were traveling through at the time. There were times it was merely months. Other times it was years. The connections I forged were real and deep because it’s the only way I know to roll. I knew “coaches” who were perfectly comfortable with the one and done approach, but I wasn’t and I’ve never done it. I’ve tried a few things – different approaches – to elevate my own performance. It’s rarely comfortable, but I’ve learned that dread and long-lasting fear is no way to roll. So some years ago when I began to morph my practice into a combination of coaching and consulting I wasn’t sure how thing might work out. I had a vision and a goal. The trick was to make it come true. It started as fear, but that very quickly gave way to anxiety as I realized nothing bad was going to happen to me. There was no threat. I’m a guy who has always asked and answered that question. Just ask my kids. I taught them to ask it, and answer it. I learned as a kid that lots of people ask it, but I never found many people courageous enough to answer it. I was always willing to answer it. So that’s what I did. I began to answer the question. And the answers were laughable. If I were to approach a CEO about the value – which I believe is extraordinarily high – of being coached and possibly joining a small, intimate group, what’s the worst thing that can happen? They could hang up on me. They could kick me out of their office. They could dog cuss me. Okay, truthfully, that first one is likely the WORST and most real one. Oh, man…what kind of a wuss am I? Somebody hangs up on you and it breaks you, I thought. There it was. The problem behind it all. My thoughts. I was letting my thoughts race out of control. I was looking into some fictitious future where terrible things would befall me simply because I was attempting to help people see and better understand an opportunity that I was never given when I was running companies. What kind of a demon, villain must I be? I wasn’t trying to sell anybody anything. Fact is, what I offer isn’t for everybody even though every top leader can benefit from it. Those who don’t see it aren’t worth my time to try to convince them (and I don’t). I wasn’t trying to convince people of anything. People either want the value, or they don’t. I wasn’t trying to persuade people to like me. People either resonate with me, or they don’t. Think about your own anxiety because I want you to learn from my mistake. I sat down the other day and hit record on my iTalk app (it’s by Griffin and it’s a terrific audio recording app on my iPhone). It’s $1.99 and well worth it. Here’s what I did – and I want this to help you. I asked myself questions. I decided to do for myself what I do for clients all the time. Sit down with myself and ask questions designed to help me gain clarity and resolve. Questioned aimed at getting to the crux of the matter. If you’ve never experienced that, but you’d like to – I’m going to share with you a kinda, sorta secret page where I sometimes offer people a no cost, no obligation enrollment session. It’s a powerful taste of what it’s like to have somebody help without any agenda other than to help move you forward — click here. I’m a smart guy. Why it had never dawned on me to ask myself these questions, or interview myself before — I don’t know. It just happened. I got the urge and notion to do it and hit record. The recording went for about 1 hour and 45 minutes. It was interrupted by some phone calls, but I picked back up after each interruption. I’ve listened to that recording at least three times now. It’s fascinating to hear how even the tone in my voice changes as I’m asking the questions to the person who is answering them. It’s all me. Just me. I did it because over the past few months I’ve learned the power of stepping outside ourselves to examine our thoughts from a more objective place. All those little voices in your head will drive you nuts if you let them. Most of us never really deal with them. The common refrain is, “Be more confident.” Simple advice. Over simplified advice that doesn’t help the person struggling with confidence. Ditto for our head noise. “Don’t listen,” is bad advice. It doesn’t work. The more you try to quieten the voices the louder they begin to shout. I knew that didn’t work so I went looking for better answers. I found them. First in some YouTube videos by Gary Van Warmerdam. I’d never heard of this guy. But I watched this video. That led to me Gary’s book, MindWorks: A Practical Guide for Changing Thoughts Beliefs, and Emotional Reactions. That was important because had I not gone through the exercise of identifying these characters in my head, these voice telling me various things – then my interview with myself wouldn’t have happened as it did. How can Conrad and Phillip both be correct? They can’t. But that doesn’t stop me from believing both of them, at the same time. See, I told you I was brilliant? Well, so are you. You have that same ability. It happens to you all the time just like it does me. You believe contradictory things about yourself all the time. Not because they’re true, but because you’re buying what they’re selling. Now I’m a Christian. If you’re offended by that, then get over it. I make no apologies for it. And I’m an elder at a small congregation in Ft. Worth, an accomplishment I’m proud of (for myself and my family). It’s not a title. It’s a work. A service. God is important. God is first. Because that’s the spot He demands. Right there I was thrown to the floor and put in a choke hold I couldn’t escape. It was a gotcha moment. I had to confess that I wasn’t trusting God as I should. I saw my big mistake. Letting anxiety rule my life and cripple my efforts in being the Christian I should be, and in helping CEOs learn about an opportunity so valuable that it could change their lives for the better. That’s it. No hard sell. No soft sell. Just an information exchange. Just two people sitting down face to face to have a conversation to examine whether they mutually want to proceed. Or not. And either way, it’s okay. Either way, God isn’t going to be pleased or displeased. What displeases God is my being anxious and not trusting Him. Shame on me. After I stopped the recording I went to a quiet, dark spot, knelt down and prayed. For weeks and months I’ve been riddled with some of the highest anxiety of my life. Putting pressure on myself and letting some others put pressure on me to make so many phone calls, contact so many people, do this, don’t do that, say this, don’t say that — and I’ve come to conclude I’ve made a terrible mistake. One of the BIGGEST mistakes of my life in recent years. I’ve let myself fall prey to my own anxieties. I’ve forgotten who I was and what I was. I’ve been listening to too many of the wrong voices and ignoring the right ones. Have you got things all worked out in your head…and it doesn’t look very good? How many characters are talking to you right now, telling you everything from “you can’t” to “yes you can?” I’ve identified 10 of my own and I’m betting there are more if I just look more closely. How many obstacles are standing in your way to achieve what you most want for your career and your company? Don’t be ashamed thinking CEOs and top leaders don’t experience these things. I’m 58. I’ve run many companies. I’ve led lots of people over the course of my life. I’ve been capable and successful. But here I am at this ripe old age battling things you’d have thought I might have long ago conquered. I’m not sharing this for any reason other than to make you realize you’re not alone. We’re all in this together. Some of us are open and honest. Some of us are more willing than others to put ourselves out there. I’m hoping that through hearing of my struggles and my big mistake you’ll find some courage to help yourself and some willingness to be helped. I thought many things mattered. Details. Strategies. Tactics. Fears. Anxieties. But I was wrong. They don’t matter. Can you open both hands and let them go? I’ll end today’s show by asking you the same question. There you sit in your nice corner office. You’re the founder. The CEO. The top dog. Everybody is looking to you for the answers. Surrounded by smart people who are employees, direct reports, service providers, financial partners and all the rest of the cast who surround you. They’re all terrific and they serve you well. But they’re all beholden to you. Each of them want something from you — need something from you. A paycheck. Their career. A contract. An ongoing client relationship. Something. But deep inside your heart and in your head is the anxiety. You believe certain things based on those thoughts. Those beliefs often limit you. But who can you talk to? Who can ask you the questions that desperately need to be answered? Who can help you open both your hands and let it go? That’s what I’m trying to do. And yes, trying is a good thing because I’m doing it, sometimes more successfully than at other times, but I’m going to succeed. I’m doing the work. By the way, I’ve got an answer to that question of who can help you do the same thing.